This species is accepted, and its native range is W. Tropical Africa to Kenya, Tropical & Subtropical Asia to Pacific. 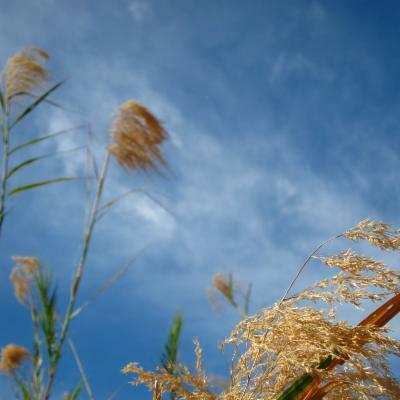 Perennial reed, with creeping rhizomes. Culms erect, up to 10 m. high. Leaf-blades 30–80 cm. long and 12–40 mm. wide, glabrous, rough to the touch beneath (at least in upper half), the tips attenuate and stiff (occasionally almost smooth or with filiform tips). 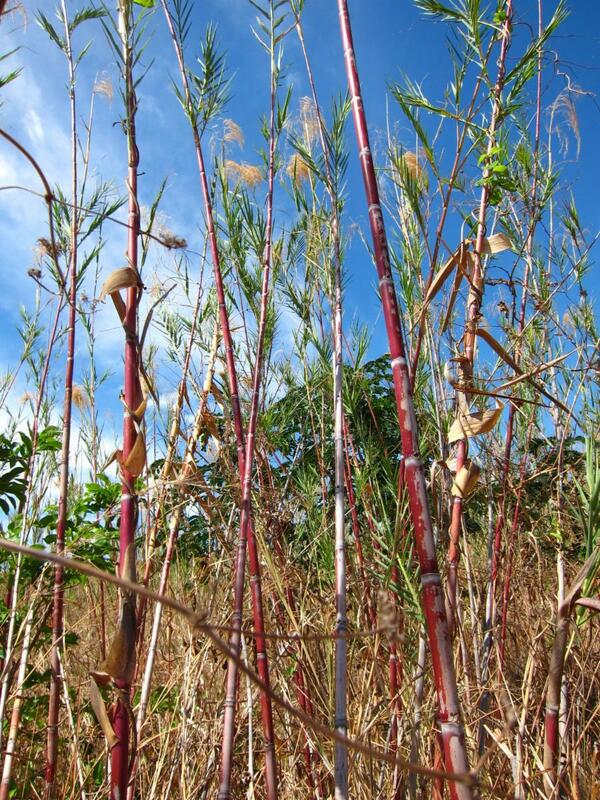 Panicle 30–50 cm. long and 10–20 cm. wide, the lowest node often many-branched in a whorl, the branches bare of spikelets for some distance from their base. Spikelets 9–12 mm. long, the rhachilla-hairs 4–7 mm. long, rather sparse; lower glume just over half as long as the upper; upper glume narrowly elliptic to very narrowly elliptic, 4–6 mm. long, acute to subacute; lowest lemma very narrowly elliptic, 7.5–12 mm. long; fertile lemmas very narrowly lanceolate, 8.5–11 mm. long. Stream sides, lake margins and swampy places; 300–2000 m.
Perennial. Rhizomes elongated. 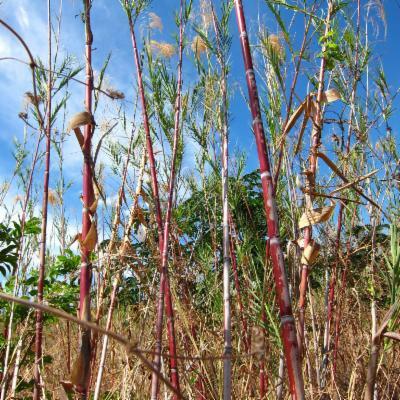 Culms erect; reed-like; 200-1000 cm long. Leaves cauline. Leaf-sheaths loose. Ligule a ciliate membrane. Leaf-blades deciduous at the ligule; 30-80 cm long; 12-40 mm wide. Leaf-blade surface scaberulous; rough abaxially. Leaf-blade apex attenuate; hardened. Spikelets comprising 1 basal sterile florets; 3-11 fertile florets; with diminished florets at the apex. Spikelets cuneate; laterally compressed; 9-12 mm long; breaking up at maturity; disarticulating below each fertile floret. Floret callus elongated; 0.5-1 mm long; bearded; obtuse. Floret callus hairs 0.5 length of lemma. Glumes persistent; similar; shorter than spikelet; similar to fertile lemma in texture; gaping. Lower glume elliptic; 0.5-0.6 length of upper glume; membranous; without keels; 3-5 -veined. Lower glume apex acute. Upper glume elliptic; 4-6 mm long; 0.5 length of adjacent fertile lemma; membranous; without keels; 3-5 -veined. Upper glume apex acute. Basal sterile florets male, or barren; with palea; persisting on inflorescence. Lemma of lower sterile floret similar to fertile lemma; elliptic; 7.5-12 mm long; 1 length of fertile lemma; membranous; 3-7 -veined; acuminate. Fertile lemma lanceolate; 8.5-11 mm long; membranous; without keel; 1-3 -veined. Lemma apex acuminate. Palea 0.66 length of lemma; 2 -veined. Palea keels scaberulous. Apical sterile florets resembling fertile though underdeveloped. Africa: west tropical, west-central tropical, northeast tropical, and east tropical. Asia-temperate: western Asia, Arabia, China, and eastern Asia. Asia-tropical: India, Indo-China, Malesia, and Papuasia. Australasia: Australia. Pacific: southwestern, south-central, northwestern, and north-central. Arundo corea Rottler ex Hook.f. Phragmites bifarius Wight ex Hook.f. 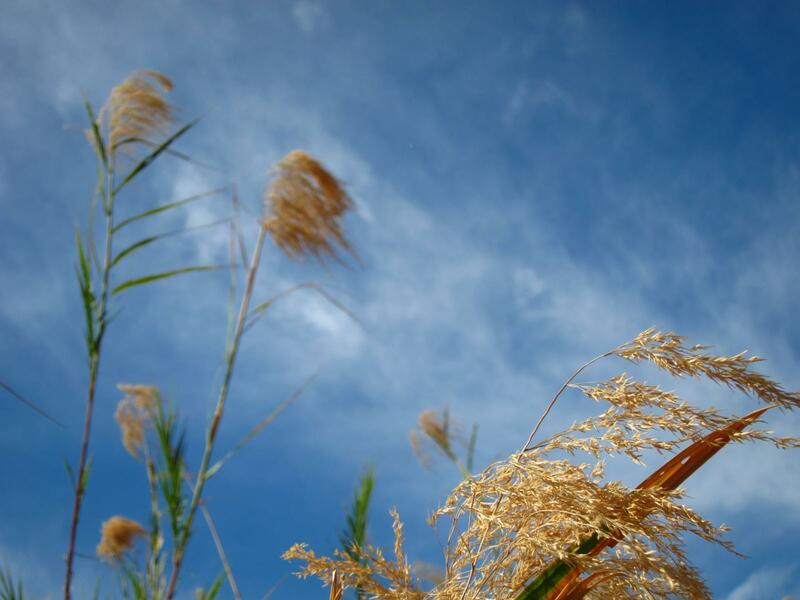 Phragmites karka var. cinctus Hook.f. 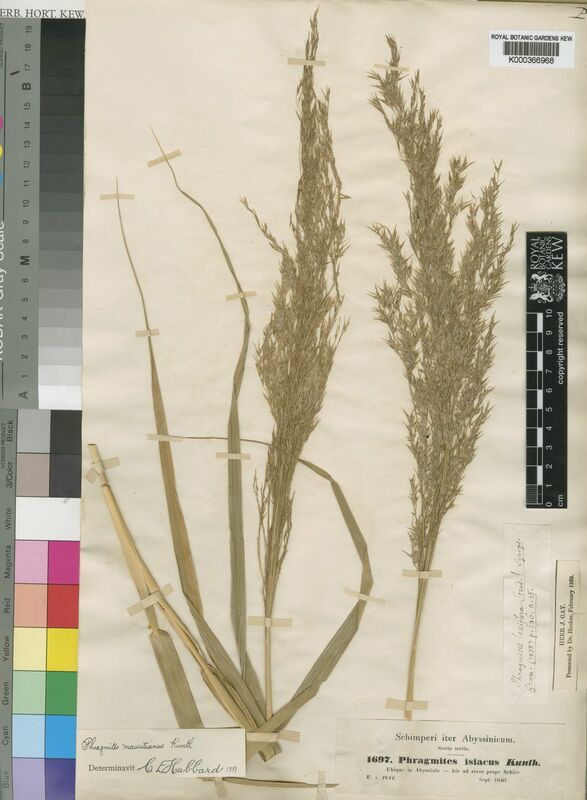 Phragmites nepalensis Nees ex Steud. Nom. Bot. ed. 2, 2: 324 (1841). Steud., Nom. Bot., ed. 2, 2: 324 (1841).